We’re back from Brad’s third time finishing an Ironman race and our mini vacation. Check out his yellow finisher t-shirt in celebration of success… So appropriate given that we’re talking about goal setting today, which is pillar five in our nine pillars of productivity series. We’re going to share with you five ways that goal setting can increase your focus and improve your productivity. And the secret sauce to greater success in goal setting. Have you been following our nine pillars of productivity series? If you missed pillar 4 on increasing productivity fast, do this 1 thing fast! Certainly, in Brad’s fitness journey over the past two decades, he was much more motivated, consistent, and on track with a clear, committed goal out in front like a marathon or an Ironman. And accountability was a huge component-physical training does that whether hiring a coach or setting a large fitness goal and tell people about it-it’s not achievable without following a program. So Brad became accountable to his coach, accountable mostly to himself, but also to the people that on Facebook that he told. In my case, with a goal out in front, I work hard to get it done. Yes, I may procrastinate a lot until the last minute, but I do what I say I’m going to do. It’s really connected to my core value around integrity. After my dissertation, I’ve written three complete books and they all had deadlines attached to them and I met each deadline. Deadlines are a little bit different than goals. Writing a book was a goal, and what helped me to achieve that goal was to have clear deadlines and external accountability to keep me on track. Goals guide your focus – when you commit to a goal, you align your actions and your intentions with that goal. You eliminate overwhelm because you know exactly what you need to be doing on a daily basis to make progress. Try shooting an arrow without a target – what’s the point? You end up wasting time and energy if you aren’t clear what you are working towards. Goals allow you to measure progress – there is nothing as supportive as seeing your progress to keep momentum going towards a particular goal. This is what Brad experienced as he trained for a specific Ironman competition. Goals can boost your productivity by helping you to overcome procrastination. There’s a difference between deadlines and goal setting. Deadlines keep us honest and on track towards our goals. Also staying in integrity with ourselves. Goals are motivational! “By making a goal you give yourself a concrete endpoint to aim for and get excited about. It gives you something to focus on and put 100% of your effort into and this focus is what develops motivation. Goals are simply tools to focus your energy in positive directions, these can be changed as your priorities change, new ones added, and others dropped.” from an article by Osman on CodeofLiving.com We’ve certainly dropped some of our activities, even though they could make us money. Goals should be realistic and attainable – doesn’t mean they can’t be big and bold but you do need to set goals with timelines. If the goals are too abstract, vague or beyond your current reach you will lose motivation and momentum. Brad and I share break down goal setting in clear, super simple ways, as well as share our personal stories about our successes and learnings. Cheers to increasing your focus and improving your productivity! Listen to the full episode here. Minette Riordan: Have you ever said to yourself, I don’t have enough time. Minette Riordan: And I’m Minettte. Not only have we said all these things ourselves, but we’ve heard our community of creative entrepreneurs say them over and over again. Brad Dobson: That’s why we created, the Structure and Flow Podcast. I’m Structure. Minette Riordan: We believe in more play, more fun and more profit. Join us as we explore the interplay between structure and flow, so that we can bring more grace and ease to your creative business. Hey everybody, welcome back to the Structure and Flow podcast. I’m Dr. Minette Riordan, along with my third time IRONMAN champion, Brad Dobson. Brad Dobson: Yay. We’re back from our mini vacation, and long workout day, successfully I should add. I’ve got my yellow finisher shirt on, which is particularly fetching I must say. She dressed up, I didn’t, but that’s okay. Minette Riordan: Well, I told him to leave his IRONMAN shirt on, and he’s been kind of wearing it everywhere. He would wear his medal everywhere if he could. Brad Dobson: Got to show it off. Minette Riordan: Absolutely. So this is hard to believe, it’s episode 106. We hope you listened in to episode 105 with Alan Brown. Minette Riordan: I think it was one of our favorite conversations about theming your days. And between what we’ve been talking about on the podcast, between talking to Alan Brown, between a two day road trip in the car listening to The Power of Full Engagement, which we’ve mentioned before on the show. Minette Riordan: We did. Alan and I talked about it because we’re both big fans of it. Brad Dobson: Oh, I hadn’t read it yet. Minette Riordan: And we’re being super conscious of how we’re spending our days. Brad Dobson: Yeah, and our energy usage and how we can renew our energy. Gosh, I think we could have a whole episode just on that book. Minette Riordan: I thought about that this morning. Yeah, I may have to change our productivity blue blueprints to include some renewal rituals. Brad Dobson: If you want to get ahead of us, go out and buy, The Power of Full Engagement. Power of Full Engagement? Minette Riordan: Power of Full Engagement, by Tony Schwartz and Jim Loehr. It was a little bit life changing, but one of the things that they talk about in the book which will lead right into our episode content, is really getting crystal clear about your core values, and your vision for what it is that you want for your life and for your business. Minette Riordan: And part of making all of that come to fruition is goal setting, and it sounds super basic and super simple, and yet we either don’t do it at all. We set goals that are really unrealistic then aren’t attainable, or we set goals and forget about them, because we actually never take them out and look at them. So on today’s episode, we want to share five ways that goal setting can increase your focus and improve your productivity. Brad Dobson: Yeah definitely, and I think there’s a … Minette kind of hinted at it, in terms of connecting goals to core values and stuff. I’m hoping that with this episode we can also give you some hints about how to achieve those goals and make them really effective. Minette Riordan: And goal setting, by the way, is pillar number, let me check my notes here, pillar number five in our nine pillars of productivity. So if you’ve been following along since episode 100, we are midstream in our nine pillars of productivity. Brad Dobson: And we have a quote today from some unknown guy, his name’s Steven Covey. Oh yeah. Brad Dobson: I think I might have heard of him. Minette Riordan: Yeah, but you haven’t read the book. Brad Dobson: No I haven’t. Minette Riordan: It’s an amazing book. Minette Riordan: Another amazing book, we got lots of books to mention in the resources links for the show. Brad Dobson: Here we go, Begin With the End in Mind. That’s it, Begin With the End in Mind by Stephen Covey. Minette Riordan: So can you talk a little bit before we dive into our five ways, about how that concept to begin with the end in mind has driven your training. Like I realized I was talking to one of our clients to Mariette in South Africa, hello, today. And it was almost 20 years ago that you did your first marathon because I was pregnant with Connor when you did your first marathon. Brad Dobson: Mm-hmm (affirmative), I was looking for stress relief. Minette Riordan: From dealing with a pregnant wife? Brad Dobson: That’s right. I don’t know how, somehow it got into my head just in terms of going longer and at that time it just seemed like a, hey, it’s something that I can put out in front of myself and try and achieve. Minette Riordan: But I was thinking about it from the perspective of how you have thought about your fitness over really the last two decades and found that you were so much more motivated, consistent and on track when you had that clear, committed goal out in front of you, of a marathon or an IRONMAN. Like you paid the money, you announced on Facebook that you were working towards this goal, and over the years you’ve done quite a few pretty big, awesome, amazing events. But what is it about the mindset of having that goal in front of you that helped you stay on track? I’m putting him on the spot by the way. I didn’t tell him I was going to ask him any of these questions. Brad Dobson: Maybe less intentional. Maybe it’s not, or maybe it’s one of those things that’s intentional that my subconscious is doing. But I think I know enough about myself to know that I need to force structure on myself. I fail, I certainly love things to be unstructured, but I don’t know that it serves me that well. Whether it’s in my conscious thought or my subconscious thought, I think some part of Brad needs to throw things out there that force structure. Brad Dobson: Certainly in my case, physical training does that whether I hire a coach or settle large fitness goal and tell people about it, it’s not achievable without following a program. So I’m accountable to myself, accountable to my coach, accountable mostly to myself but to also to the people that I told on Facebook or whatever, things like that. So I need that out there. Sure, part of it is a little ego stroking. I get to have the medal and show it off, and things like that. Minette Riordan: And the tee shirt. Minette Riordan: You got the tee shirt, and the hat. Brad Dobson: I’m okay with that, I’m not too full of myself, but it’s nice to be able to say that. But at the same time, there’s so many benefits gained along the way by having that out in front of me. That can be a challenge when it’s a work goal because you might end up slave driving yourself, but certainly you can get a lot done that way, and it can be a lot of fun too. Minette Riordan: And so for me personally, those goals haven’t been physical as much as they’d been mental and intellectual. So for example, I have a PhD from Stanford University which I’m pretty darn proud of about as well. And one of the things that I remember is when I was completing my dissertation and I was on the job market looking for teaching positions, and I wasn’t quite done with my dissertation. It wasn’t time to turn it in yet. I had about a semester left to go, and I was interviewing for these jobs and they said, “Come back next year when your dissertation is really done.” And these people didn’t believe me, that I was going to finish my PhD on time exactly when I said I was, and it really ticked me off because I am very deadline driven. Minette Riordan: When there is a goal out in front of me, I work hard to get it done. Yes, I may procrastinate a lot until the last minute, but I do what I say I’m going to do. It’s really connected to my core value around integrity. I’ve also, after my dissertation, I’ve written three complete books and they all had deadlines attached to them and I met the deadline. I owned a publishing company for 11 years. I had a first quarterly, then bimonthly, then monthly deadline to get a magazine to press. I never in eight years of printing that magazine missed a deadline, ever. Never slipped a deadline. So deadlines are a little bit different than goals though. Writing a book was a goal, and what helped me to achieve that goal was to have clear deadlines and external accountability to keep me on track. Minette Riordan: The first book I wrote, I coauthored with my dear friend and colleague, Dr. Caron Goode. It’s called, From Fizzle to Sizzle, and it’s a book all about repairing your relationships. Completely unrelated to anything that we’re doing now. Actually, so is my dissertation, but the other two books I wrote, I also worked with a coach. We’re big fans of having that external accountability and actually she wasn’t a coach, she was the publisher of the book, but she served that accountability role. She created this awesome spreadsheet for me that clearly outlined all of the deadlines that I needed to meet in order to get the book published and out to the public at a certain date. Minette Riordan: So I think all of these things go towards showing how goals can increase our focus, but there’s some other things about goal setting that we want to share that are really important and some mistakes that I personally made when I owned that publishing company. I had great deadlines, I had massive productivity, but I didn’t actually have clear goals. I just kinda started the business thinking, “Oughta be fun. I’ll make a little money,” and it always felt like this rolling stone that I was chasing, not that I was leading. And the truth was, after we actually brought in a coach to help us really look at what’s the vision for the company, I got really clear. I didn’t really want the company. Minette Riordan: So that was kind of a difficult and challenging awareness, but when I started that company, I had no idea where I was going with it. And because of that, I don’t think that I made the progress or got the productivity. Or I got the productivity, I didn’t get the profitability out of it that I wanted because I wasn’t clear what I wanted to get out of this company, right? Minette Riordan: So it was super important to think about how goals can really guide your focus. One of the things that we hear over and over and over again from our clients, and the people in our productivity for creative business owners Facebook group, which is a free Facebook group. You can come connect and play with us over there. But I hear, “I’m overwhelmed,” or, “I’m stuck,” and usually for me that’s an instant indicator that they don’t have clear goals out in front of them. Because what goals do is help you to align your focus and your actions so that you create consistent forward progress and you stay in motion. They’re naturally momentum building. Brad Dobson: I think it’s doubly so when they’re aligned with your core values, which is a crucial part of things. 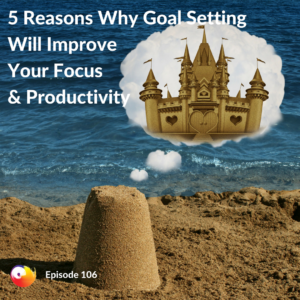 So let’s get into what the five reasons why goal setting will improve your focus and productivity are. Minette Riordan: I just shared number one. Brad Dobson: I know, but we didn’t start to tell them. Minette Riordan: Oh, we got to be really official and not just chat, is that what you’re saying? Minette Riordan: Okay. We’re going to be organized and structured in our talk today since this is the Structure and Flow podcast. I was in flow. Brad Dobson: Number one, goals guide your focus. When you commit to a goal, you align your actions and your intentions with that goal. And as you can see, like I was saying, if you’re not clear on your core values, and they’re not guiding and informing that goal, you’re going to struggle with that focus and achieving that goal. Minette Riordan: Absolutely, one of the articles that I read had a great analogy. They said, trying to build a business without clear goals in place is like shooting an arrow at no target. Brad Dobson: It sounds kind of zen. Minette Riordan: It does, is very zen, that could be a great column couldn’t it? So we won’t go down the Buddhism track today, maybe another day, but having goals out in front of you instantly eliminates overwhelm, increases clarity, and allows you to create, as I said, consistent momentum and progress. So focus is the key here, and I think we might’ve done some shows on focus. In fact, one of my topics that I love to speak on is either fierce focus or finding focus. Because focus for creatives is a challenge, and it’s the combination of structure and flow where you will find that focus. So goals provide the structure that actually allow for focus and flow. Minette Riordan: Now go onto number two. Brad Dobson: Number two, goals allow you to measure progress. I’m all about measurement because especially with training. Minette Riordan: Oh, share about training peaks and what you were talking about with training peaks. Brad Dobson: Sure. Well, so training, we probably talked about it a long time ago. Training peaks is an online tool in an iPhone app and stuff, where I can upload my workouts and my coach can schedule my workout. So he can say, “Hey, today you’re going to, or this week you’re going to do these workouts on these at these times.” And then using my fancy watch and heart rate monitor and things like that, I can track how that workout goes and upload the data and he can review it. Minette Riordan: So in our business, Brad uses something I’m not as good at it as he is called Jira, which is similar, right? Brad Dobson: In a sense, sure. Minette Riordan: You put all the tasks associated to a goal inside of Jira and you get to track your progress by saying that a particular task is done. And both the training peaks, and Jira, and to do lists, as long as they’re … I have a whole thing about to do lists, I wouldn’t even go there. But the thing about the goals, having them be measurable is so crucial. You want to know that the actions that you’re taking are helping you make consistent progress, because progress actually leads to one of our goals. Minette Riordan: One of our five keys, which is that goals are motivational, and when the goal is measurable and you see the progress and you start to see results it increases momentum, inspiration and excitement, right? Or, you realize that you’re making no progress towards your goal, you get to do some of the deep mindset work that’s required to grow a business as well. Which is, why aren’t I making progress on this goal? We’ve done a lot of that work this year as well. Brad Dobson: And I think there’s a crucial part to the the measurement part of things that maybe creatives and free flowing thinkers aren’t necessarily going to be happy with. And then it means you have to do a little analysis, because you can’t measure some amorphous ambiguous statement of work. You actually have to have an estimate of how long it’s going to take. Brad Dobson: Right, but the point was you needed to know how many paintings you needed to create that work ahead of time. Minette Riordan: Yes okay, I got you. That’s where you’re going with the analysis. The pre analysis, not the post analysis. Brad Dobson: Right, it doesn’t help you to have created three paintings if you needed a thousand by next week. I mean yes, you could celebrate those three paintings. Minette Riordan: Gotcha. So it’s one of the things that is an essential part of our business planning process with our clients in the creative business accelerator. Is really helping them understand how many sales do they actually need of their products and services to reach their financial goals. A great example of a goal is a particular financial goal and annual, or even a monthly financial goal. You will not attain that goal if you’re not clear about the steps that are going to get you there. And it starts as Brad is saying, maybe you need to sell 500 prints of one painting or one original. Like your clarity around those numbers is also part of the measurement, and also part of the success and motivation. By the way, can I celebrate? Minette Riordan: Speaking of goals, that I just sold my first original piece of artwork. High five, super exciting and totally random. Like I keep saying I’m going to put my art out there for sale, which I haven’t done yet. Brad Dobson: She says it’s random, but her art’s really good, so it’s not that random that it happened. Minette Riordan: It’s random because someone found one of my images on my blog and said, “Hey I want that,” and sent me a bunch of money for it. So it was darn pretty darn exciting. Brad Dobson: But finally, in terms of measurement, as the saying goes, it’s what you watch. The numbers that you watch are the ones that’ll actually change. If you’re not watching it, if you’re not measuring it, you won’t see any improvement. Minette Riordan: And I think another analogy with fitness and training, building a business is a lot like a fitness and training plan in so many different ways, is that things get easier as you go. Like a year ago, could Brad go out and ride how many miles for the IRONMAN? Minette Riordan: 112 miles, just for the bike ride. So could he do that a year ago? Not as effortlessly as he did during the IRONMAN. He built up to that over a year’s time, but every time he went he added a little bit of progress. He made a little more progress. I find that sales are exactly the same. And speaking, public speaking is another great example, that every time you go you’re a little bit nervous and a little bit less nervous, and then you’re not nervous but maybe not excited, and then you become like me. Totally crazy excited to get up on stage in front of hundreds and hundreds of people. Minette Riordan: I think I would still get really nervous if I was on stage in front of thousands of people, but that’s a goal for me, is to be on a stage in front of a room full of thousands of people. That’s a big goal, but I have to start by speaking to small groups, and medium size groups, and working my way up to those big groups. If I get really lucky and just thrown into the fire and said, “Hey, tomorrow you have to go speak in front of 3000 people.” Would I do it? Hell yes. Would I be scared shitless? Yes, but you go and do it anyway. So part of this momentum and motivation is clarity around setting a goal, which is number five on our list, that’s realistic and attainable. Maybe not tomorrow, but it is realistic, and it is attainable, and it is measurable. Brad Dobson: Cool. So we move on to number three? Brad Dobson: Goals can boost your productivity by help … Sorry, my glasses are freaking out. Well, not my glasses, just the angle. Brad Dobson: Goals can boost your productivity by helping you to overcome procrastination. I never procrastinate. No I’m always perfect about that type of stuff, thank God. Brad Dobson: I’ll wait until the last minute. Minette Riordan: A lot of times we procrastinate if we aren’t clear about the scope of work, and we usually tend to either overestimate or severely underestimate the amount of time it will take us to reach a goal. So the more that you measure and analyze, as Brad said, but the more that you track your progress, then you get to have a better, more realistic perspective on how long it will take you to reach a goal. Because it can be tricky to make your best guess, and I remember when you were contracting as a software engineer, that one of the things that you got really good at as a contractor was being able to estimate the amount of time it would take to complete a project, and padding that time. So you always had a happy clients, right? Minette Riordan: So you usually got things done under schedule, not over schedule because you padded time. So when it comes to being a creative business owner and managing your own time, make sure that you’re clear about allowing enough time to reach your goal. And so procrastination, the other aspect of procrastination we wanted to talk about was a difference between a goal and a deadline. So for example, I had a goal to write a book. There were many small deadlines associated with the completion and creation of that book. Some of them were my responsibility, some of them were editors, some of them are the book designers. Brad Dobson: I still hate them. Minette Riordan: You still, you do? I love deadlines. You need parameters, right? Minette Riordan: So think about how can you create some rules for yourself around productivity that will help you track progress if it’s not a deadline. Minette Riordan: I get to be the boss. Minette Riordan: It’s funny, I don’t do that in my business. Brad Dobson: If you go out and sign up for a race. Minette Riordan: It’s an external deadline. Brad Dobson: Yeah, you spent that money, you told your coach about it and hey, you know, you gotta make it to the starting line on that day. That’s a lot different when you’re a solopreneur and hey, you know, you could maybe surf today or go out for tea. And so you need to find things that can provide you that impetus to where procrastination isn’t even a question. That’s actually key, is to make it so that you can’t even think about procrastinating because it needs to happen. Minette Riordan: And so here’s a fun idea for how to make that happen, and Brad shared this about some of the events that he participated in. If you’re going to write a book, launch a new course, start an email campaign, go post it on Facebook and asked for an accountability buddy. Or if you have an email list already and you have a new project that you’re working on or a new release that’s coming and you’re dragging your feet, go announce it publicly. And then you’re innate integrity won’t allow you to not get done by the dead time. Minette Riordan: So when you make that promise to someone outside of yourself, you will take the steps needed to make it a reality. This morning I was working, as I mentioned earlier, with our client Mariette, who’s in South Africa, and she felt like she was out of integrity she said. Because she hadn’t gotten all the things on her to do list done that we had set out, but when she told me what happened instead, she was in complete alignment in integrity with the progress that we’re making. Minette Riordan: And so there’s a postponement of a couple of the different activities, but I’m still holding her accountable. So for me there wasn’t a misalignment of values. There was only, hey, these things are getting shifted naturally and organically because of X reason. And so it’s just really tracking carefully if you’re slacking and not meeting your own deadlines. One, where you can you increase accountability or two, what’s the mindset? Last night at our meetup there was a woman who’s starting a brand new digital marketing and social media company, and she wants to launch her company by July 1st. Minette Riordan: Well, July 1st is right around the corner, about three days from now, and so when we really started to dive into what was happening in the mindset, she was stuck in perfectionism. She was really getting fearful about reaching out and sending proposals out to clients. She had one client, or one person who had expressed interest that she was really clear she didn’t want to work with, wasn’t sure what to say to that person. So all these things can come up from a mindset perspective and get in the way of us achieving our goals. So as you’re measuring progress, make sure that you’re measuring both your mental thoughts and beliefs about the progress, as well as your actual physical and actionable progress. Brad Dobson: Yeah, and once again, it’s a very forceful place to be in, to be motivated by your integrity. If you’re anything like Minette or I, where there’s just no question, you can’t be out of integrity. So if you can set up your goals where not achieving them puts you out of integrity, you’ll find that motivates you very strongly. Minette Riordan: Absolutely. So I’m going to recap real quick because we’ve been giving you a lot of information and then I’ll move on to number four. So the first one is that goals guide your focus. They keep you in action in a really healthy way. Goals allow you to measure progress and celebrate that progress every single step of the way. Goals boost your productivity by helping you to overcome procrastination. And finally, goals are so motivational. The whole IRONMAN thing that we’ve been talking about, the motivation is huge. But I found this great statement from a guy named Osman, didn’t have his last name, on a blog on codeofliving.com, and I loved his definition of a goal. Minette Riordan: I’m like, “Brad, I got to get this where I can read it.” By making a goal, you give yourself a concrete end point to aim for and get excited about. It gives you something to focus on and put 100% of your effort into, and this focus is what develops motivation. Goals are simply tools to focus your energy in positive directions. Remember that the goals can be changed. Priorities change, new goals get added. We dropped others, but goals are motivational. They keep us in action. And so I wanted to talk about our planning meeting on Monday that we were doing, and about how we sat down and looked at all of our active projects and goals that we have out in front of us. There’s lots of them, and how we made clear choices about what to drop and what to focus on. Brad Dobson: So this is relevant for myself and hopefully for people like me with a lot of that bright shiny idea syndrome. Where you feel like there’s these fantastic ideas percolating in the front of your head. Put those on different note cards, especially for short term to medium term type of planning, and set them out and look at your priorities. And then figure out what it is that’s actually achievable that you’d feel excited about doing in the short to medium term. Minette Riordan: Yeah, that’s so true, and for us, we’re pretty excited. We’re doing a launch, or it’s kind of a relaunch and reopening, of our creative business accelerator in mid July. You’ll be hearing more about that over the next few episodes. And we have a lot to do for that launch, and it’s the only thing that matters in our timeline right now. So it’s not about saying we’re never going to get to these other projects. It’s about shifting our timelines, and to me it’s motivational to focus on one goal at a time and even inside that goal. I know some of you love your multitasking, but did you know that it’s been proven that multitasking kills brain cells, and actually we really can’t sustainably multitask on any project. And that true business success, I say this to my clients all the time, comes from consistency more than anything else. Minette Riordan: And if I and Brad start to fragment our attention away from what’s most important, then we don’t make progress towards any of our goals or we make a snail’s pace progress towards our goals. So it’s so important to get crystal clear. So we have this huge launch that we’re planning. We’re still are doing this podcast. We’re still doing our Monday motivational email series. We’re still connecting in our Facebook group and doing our social media. It’s not like we’re dropping those ongoing sustainable projects, but that our primary intense and crystal clear focus is on one goal at a time. So we’re really clear about how many projects we can align with at a time as well. Brad Dobson: Right. So let’s get on to the fifth and final reason why goal setting will improve your focus and productivity, and it is that goals should be realistic and attainable. Oh, help me out here Minette, I don’t know what you wrote down. Minette Riordan: You were not supposed to read the notes. Minette Riordan: You were suppose to talk about the notes. This is a great example of some last minute planning. We just came back from vacation. We’re trying to get some more episodes in the bank. We were ahead of the game and now we’re like barely making our deadline again. And it’s not how we love to operate, and you can see how the wheels totally roll. Fall off, the wheels fall off when you aren’t prepared in advance. Minette Riordan: So the fifth reason why goal setting improves focus and productivity is because when you’re clear about setting a goal that’s realistic and attainable, you’re motivated to do it. What happens when you set a goal that’s too big or too far out of reach is that it feels completely overwhelming and you can’t see a clear path from where you are to reaching that goal. So in our live events, we would have people come in and set their financial goals at, “I want to make a million dollars in the next year,” but currently they’re making no money.The business is brand new. They haven’t even started seeing clients. Minette Riordan: And when you do the numbers to realize how many clients they would actually have to see in their current business model, in order to get to a million dollars, it’s actually impossible to do that unless you have a lot of money to hire a team and you have products ready to sell to the masses. It’s challenging. Is it possible to get to seven figures in a year? Yes. But with most creatives business model, no, not in year one. So getting crystal clear about realistic, attainable goals will help you stay motivated and excited because it’s attainable. And Phoebe’s here to say hello. Brad Dobson: Our cat. That’s the meowing, it wasn’t me. Minette Riordan: She’s so distracting. Brad Dobson: You need to have goals that are realistic. They need to be big, they need to stretch you. That’s critical. I mean, you don’t have to be pushing yourself beyond your boundaries for every goal, but go ahead and do that. Be Brave, be courageous. I feel like I did that with IRONMAN, and we’ve done it with starting our business. It stretches us. Minette Riordan: So should I go let the cat out now or are we going to talk through the meowing through the end of the show? Minette Riordan: We call them minimum target and stretch goals in your business, were your numbers and your sales goals, and that would be true for our launch of the creative business accelerator in July. We’ll have a minimum target and a stretch goal, but it’s also just building your Facebook group. How many people do you want to add in a 30 day period of time? Have a minimum target and a stretch. We always love to talk about one of our former clients, Yolanda Williams, who did two live events and both times busted through her stretch goals, so shocked and surprised her. Right? Minette Riordan: It was awesome. So it’s really important that, I don’t know if I like fallback goal, it makes sense in the context of the IRONMAN, but have that minimum goal that you’d be happy with and that stretch goal. So no matter where you fall in the range of minimum, all the way through that stretch, you’re happy no matter what. I think it also helps us to realistically manage our expectations about what’s possible. Brad Dobson: Right. Yeah that minimum is going to be roughly what your current performance is. So if you think that you can convert 10% of the people that come to your webinar and you convert 10 in the next webinar, then you kind of hit your minimum, or between minimum and target. Target should stretch you a little bit. Maybe a little more than a little bit, and stretches is, “Hey, I had a fantastic day, this is beyond my wildest dreams.” That type of thing. Brad Dobson: So you can have something where you can buy the better champagne. Minette Riordan: And connecting them to numbers is so powerful, and I know my sweet creatives, you don’t like to talk about numbers, but numbers are what drive profits in your business. It’s so important to pay attention to your numbers, and we have just a couple more things to finish up. We want to remind you that if you’re curious about what your unique productivity style is, go take our quiz at pathtoprofitacademy.com/upsquiz, upsquiz, no caps or anything. Pathtoprofitacademy.com/upsquiz. Brad Dobson: Good stuff, and in the next episode, episode 107, we’re going to be talking about, it’s either seven or nine types of planning. Minette Riordan: It’s seven, seven types of planning. Brad Dobson: Seven types of planning. Minette Riordan: Nine would be too many. Brad Dobson: That will boost your productivity and your profits, and is that the next pillar? Minette Riordan: Yeah, it will be pillar number six of nine in our nine pillars of productivity. Minette Riordan: And we’re gonna talk about different types of planning, because it’s easy to just talk about why planning’s important, but we’re going to be really specific about types of planning that you should do annually, quarterly, monthly, weekly, and daily in your business. And this is what will drive consistent, steady progress, towards all of your goals that you just set after this episode. Brad Dobson: Good stuff. Go out there, set some goals, achieve them. Minette Riordan: Yeah, we’ll see you next week on Structure and Flow. I’m Minette, this is Brad, have an amazing week. Brad Dobson: Thanks for listening to Structure and Flow, the productivity podcast for creative entrepreneurs. To find out more about this episode and others, go to pathtoprofitacademy.com and click on a podcast link. ← [Monday Motivation] If not now, when?